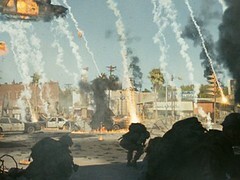 The first of the many alien invasion movies to release this year, World Invasion: Battle Los Angeles is a mistake. Aliens are clearly still a soft spot to excite the folks at Columbia Tristar, but this one has got zilch characterisation and no layers in the storyline. Non-stop action, little breathing space for dialogue and all you’re left with, is a film ticket you regret having bought. World Invasion: Battle Los Angeles is a painful action movie to sit through. One of those films which makes you despair for worthy newcomers in the industry - great scripts which find no producers - and instead go into mindless special effects bonanzas like this one, all in the name of a science fiction film. Trouble is, the film takes itself seriously and you begin to look for the Exit sign in the theatre. The film is nothing but a 2-hour long action sequence, shot in a manner which Barkha Dutt’s cameraman would have shot the Kargil War: running, ducking from bombs and lasers, with absolutely no aesthetics to photography and no reason for slow motion. Some may argue that it takes the viewer in the centre of the action - and believe me it does, some laser bullets feel like they’re coming through the screen - but why would I want to be amongst a bunch of characters who adhere to the most terrible cliches of American film casting (an Asian, an African, a Latin American, etc) and possess nothing interesting to boast of, not even a sense of humour. The dialogue in the film is mostly incomprehensible - the most common ones being “Move!! Move!! Move! !”, ‘Watch out!!”. I get the feeling that the sound design artist, responsible for creating sounds of gunshots and bomb explosions, must have charged - you guessed it right - a bomb. Action overcomes everything else in this film, which doesn’t even make a lame attempt at explaining logic. Americans are known to be proud of their Armed forces - the Marines - and this film is another attempt at glorifying their role in the middle of any crisis. When the world is suddenly faced with an alien invasion, Captain Nantz (Aaron Eckhart, in a solid performance) and his platoon do everything they can to save a bunch of civilians in Santa Monica, even as major cities across the world attacked by a meteor shower that brings along aliens. Any sense into the whys and hows of the invasion is made clear by edgy news reports - some say it is a colonization, some say they’re here for our water. All this could have been depicted through a new character of a scientist/expert on these things, but director Jonathan Liebesman (The Texas Chainsaw Massacre, Darkness Falls) and writer Christopher Bertolini (The General’s Daughter) decide to skip all such formalities and focus only on the platoon instead. The result is a film where the characters are just shooting aliens, and some more aliens and some more. Alien invasion films got a new life a couple of years back, when Peter Jackson produced District 9 - it was classy, made globally significant statements about colonization, evacuation and humanity, all in CNN-style again. But it managed to touch a chord somewhere, through more developed characterisation and the docu-drama feel. It was so much more believable. Heck, even the aliens looked better designed. Which means, there’s always a way to make an alien invasion movie interesting. Apocalypse itself is a great theme to draw people into theatres (2012 was a huge success in India and Rolland Emerich continues to make movies on the same theme) - we all want to indulge in that one scary fantasy of how it would feel like to see the world come to an end. Despite being done to death, the success of District 9 showed that aliens still continue to fascinate us, provided there are interesting characters and there’s finesse involved in their making. World Invasion: Battle Los Angeles could have won some brownie points had it tried telling the story through the eyes of the civilians - that way, we’d have got a sense of why Americans love the Marines so much. We don’t know what aliens look like, but why not add some quirks to their character design? This film’s aliens look plain ugly, as do their spaceships and it becomes apparent that not too much time and thought has been spent on them. This special effects film looks good when it begins - the overhead shots of the coastline under attack looks breathtaking, but after a point the novelty of all those explosions wears off and you’re just waiting for the film to end. So I’m at my sarcastic best when I say that it’s a great movie to go for, on a date. The theatres will be empty. So-So, by Enjoylyrics.com : .